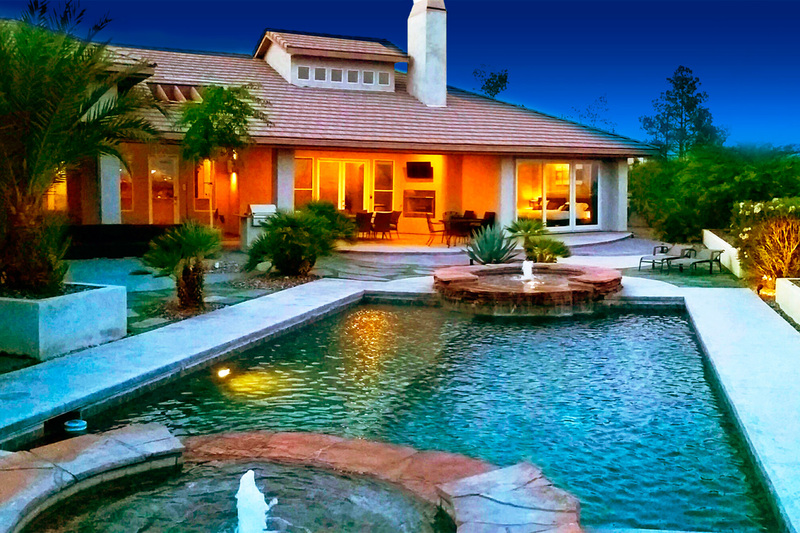 Enjoy the Las Vegas strip from your private pool and backyard. With truly unique luxury custom homes, amenities, and most desirable locations you will not want to stay anywhere else in Las Vegas. Your home away from home. 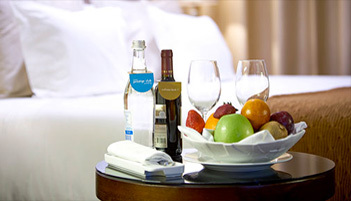 5 star amenities and high-end furnishings. Whether travelling for business, leisure, anniversaries or sporting events, we are confident that we will meet your required need and you will feel like you have come home. Outstanding 5-star service. Offering friendly, professional and prompt service. At Monroe Estates we value our guests and endeavour to surpass your expectations in every way. This home is custom built equipped with 5 star amenities, private luxury view, single story, 4 bedrooms with 2 masters and 3.5 bath, sleeps 14. Conveniently located close to everything! 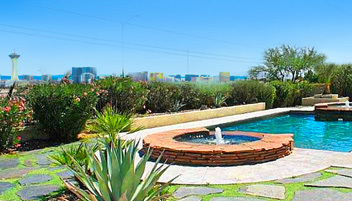 Just minutes from the Las Vegas Strip, Summerlin, Red Rock, Tivoli Village, Boca Park, Convention Center and many more. 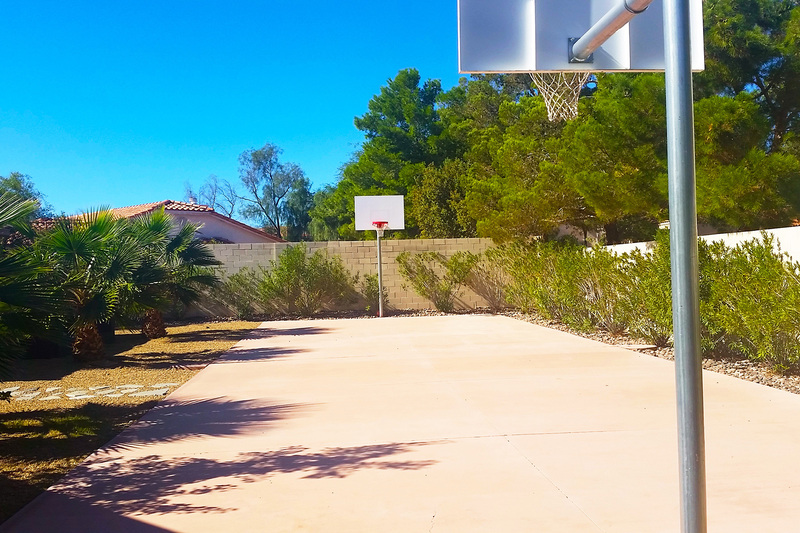 Large half acre property in cul-de-sac offers great privacy in resort setting with unobstructed 180 degree stunning views of the Las Vegas strip and a full length multi-sport game court, including a basketball/volleyball court. We had a great time, we stayed over New Years & was able to watch the fireworks on the strip from the pool area. Had an amazing time, spent most of our time in the game room. What a wonderful home. It had all the trimmings you require to make your stay in Vegas awesome. If your not into the hustle and bustle 24x7 and have a large group, this is the place to stay. Communication was first rate and we will come back again. The view of the strip was amazing and the pool/spa a great place to relax after a long day. We found this house and after a few photos we knew we want to stay there. Our family from Europe came for reunion and it was perfect place to gather. Game room was the busiest room and then jacuzzi. Great view of the Strip. House is spacious and comfy. We will definitely come back. 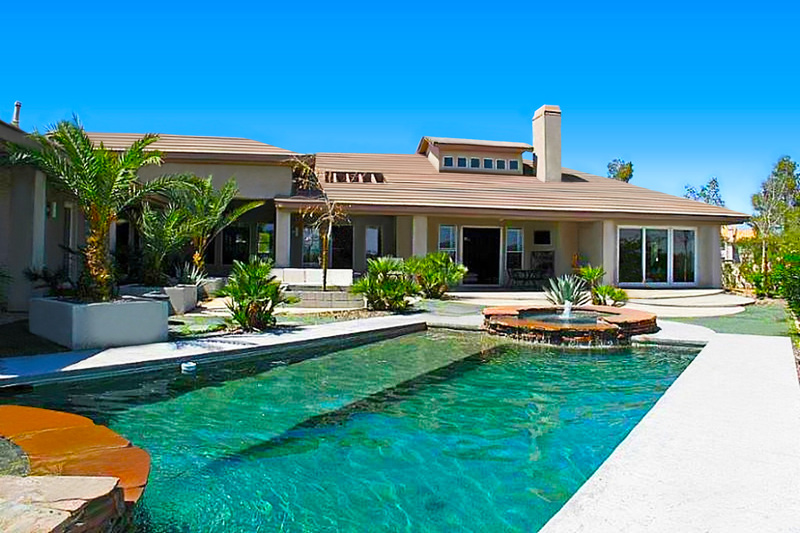 This gorgeous 3500 square foot home sleeps 14 people comfortably. It is professionally custom designed and decoratted with high-end furnishing and electronics. A few features include outdoor and indoor gas fireplaces, gourmet kitchen, Italian leather sofas, memory foam mattresses, and imported Italian floors throughout the home. 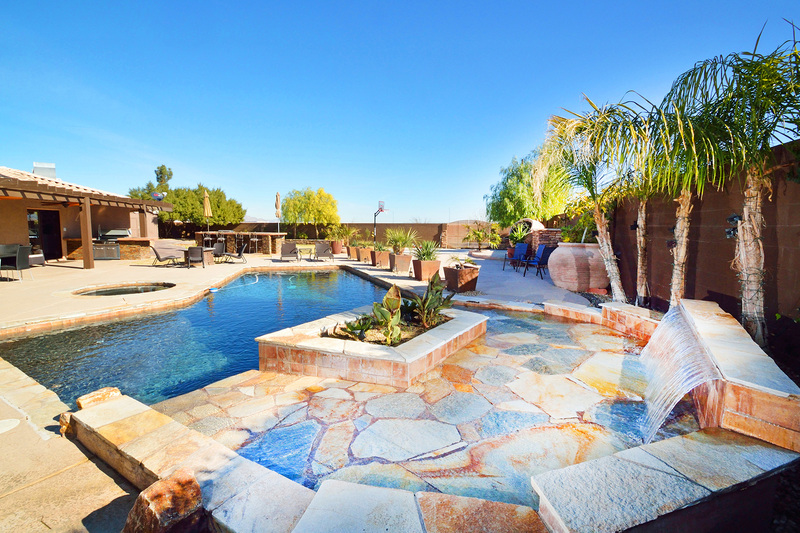 The large spectacular backyard features a 30-foot pebble tech private pool and hot tub, bbq, fire pit and strip views. Master bedrooms are both very large and private, perfect for sharing amongst family or colleagues. 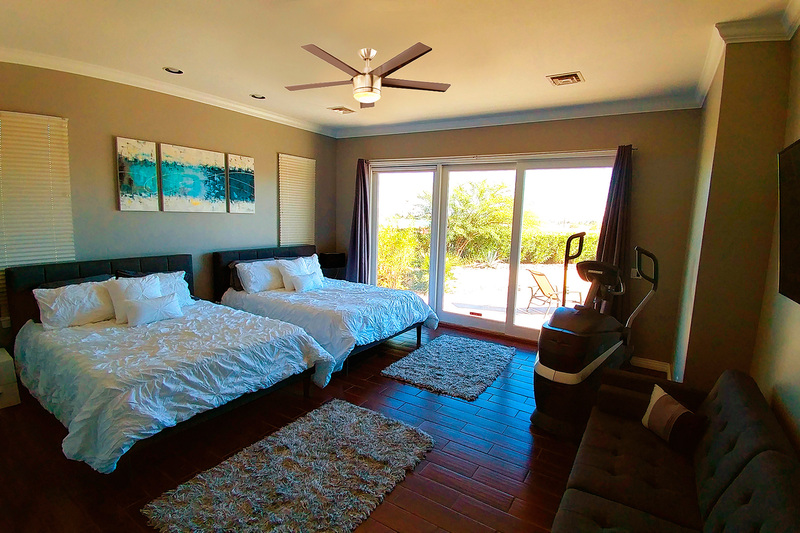 Digital controlled AC/Heating units in the home, ceiling fans in each room, and custom walk-in closets in all bedrooms. 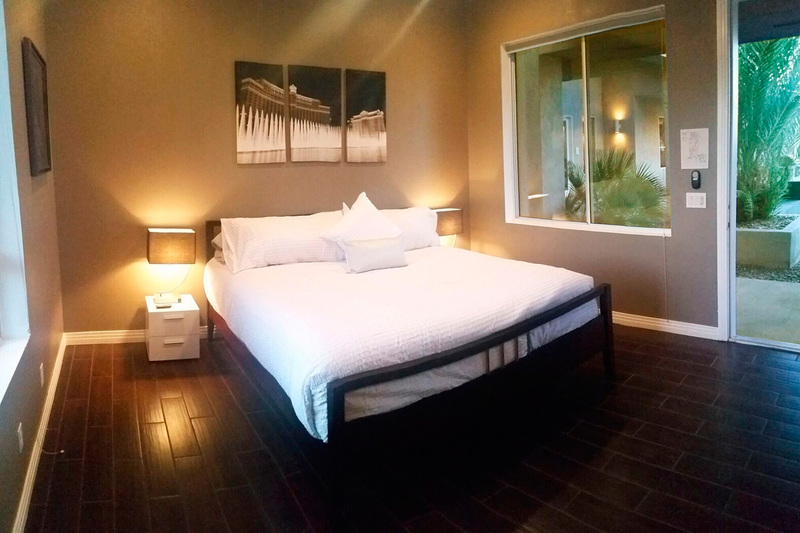 Each master and guest bedrooms also have flatscreen Smart TV's with Satellite and Direct TV with over 140 digital channels including satellite radio, and free movies for your enjoyment. 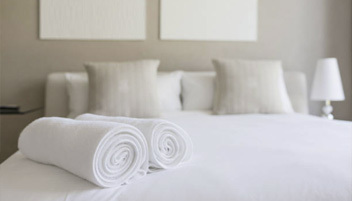 Fine soft towels, Egyptian cotton sheets, pillows and memory foam mattresses are also included in every bedroom. For those who need a place to work there is a workstation for your convenience and complimentary high-speed WiFi. 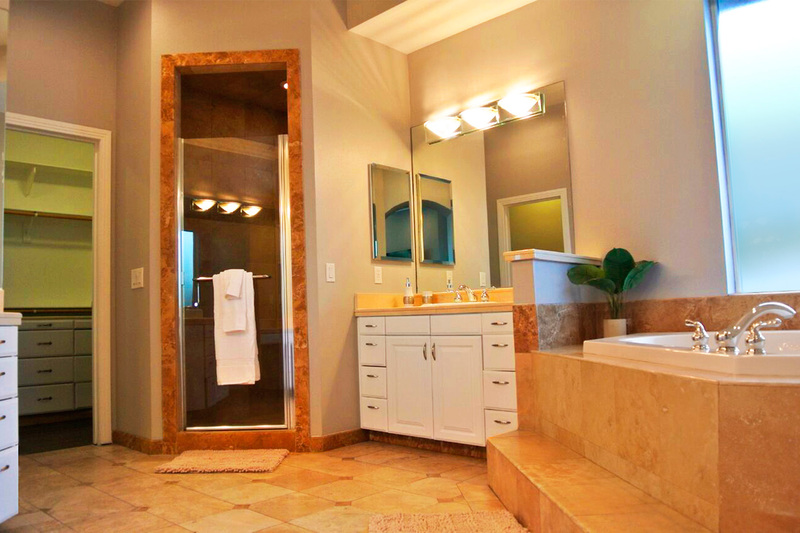 Jacuzzi deep soaking baths, chrome fixtures, travertine imported tile flooring and walk-in showers. It also comes with a full size laundry room with a large Samsung washer and dryer and complimentary laundry detergent. 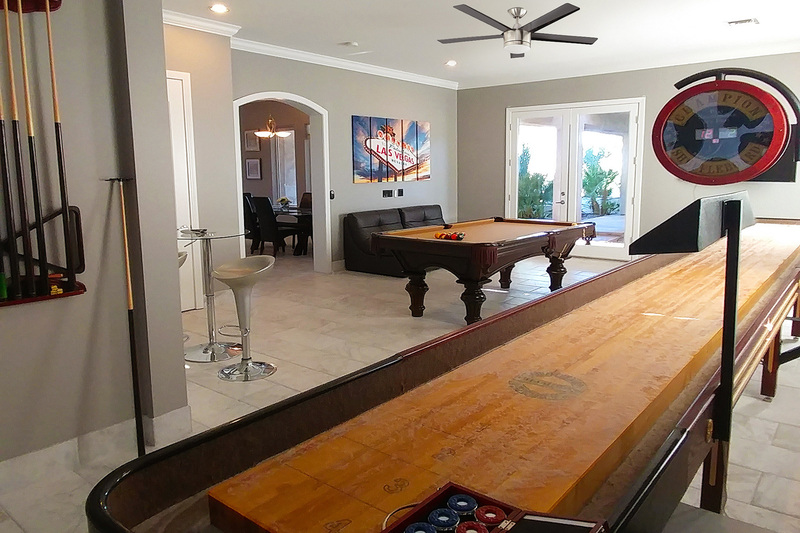 This home also comes with a very large games room that includes a professional custom made 20-foot professional shuffle board, and a flatscreen TV with sitting areas. Games room also comes with a professional pool table and many cue sticks to play with your friends. A private full length multi-sport game court, including a basketball/volleyball court and outdoor seating areas. A spectacular backyard with a barbeque and outdoor modern patio furniture with lots of seating, fireplace, and a gas fire pit. 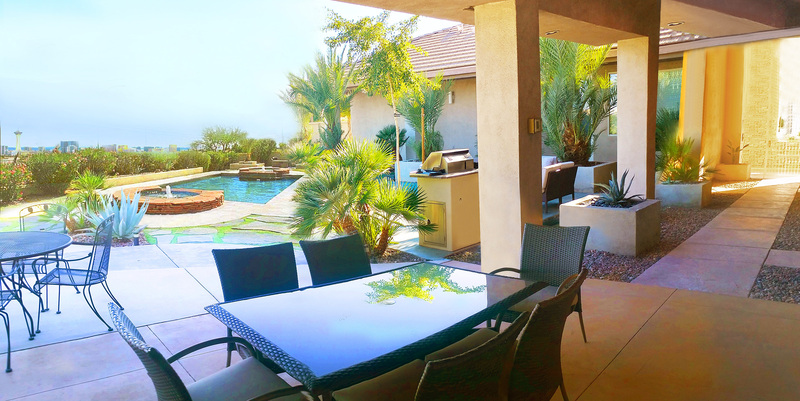 The backyard is filled with beautiful landscaping with numerous palm trees, landscape lighting and anti-slip pool deck. Also included is a 30-foot pebble tech private swimming pool and hot tub all controlled with the touch of a remote. Pool has a ramp built into it for the children and elderly as easy and safe access and lounging.